A great recipe that can be eaten at any time of day. For breakfast, lunch or tea. 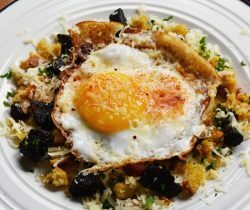 Combining earthy, mellow black pudding with crispy croutons and a wonderfully rich duck egg. 4. Place into a bowl and mix together with the rapeseed oil, adding a touch of salt and pepper for seasoning. Now scatter the crumbs onto a baking tray, making sure that everything isn’t clumped together and bake for 12-15 minutes, until they are all crunchy and golden.